Our first step in understanding all the things that need to happen for our rich, full lives to go well was to try to write them down. Jessica and I stood together in front of the large drafting table, notating tasks on post-its. We started slowly and then hummed along. We weren’t putting everything on the table to count who does more, but it was hard to quiet my defensive desire to itemize my tasks and prove they stack up. Secretly I was scared I’d come up short. This feeling is a key reason to do this project. Our shared goal with this process (and this blog) is to document all these things, and to understand who does what and why. Then we’ll be able to make decisions together about how our household runs, and the changes we need to make individually and together. 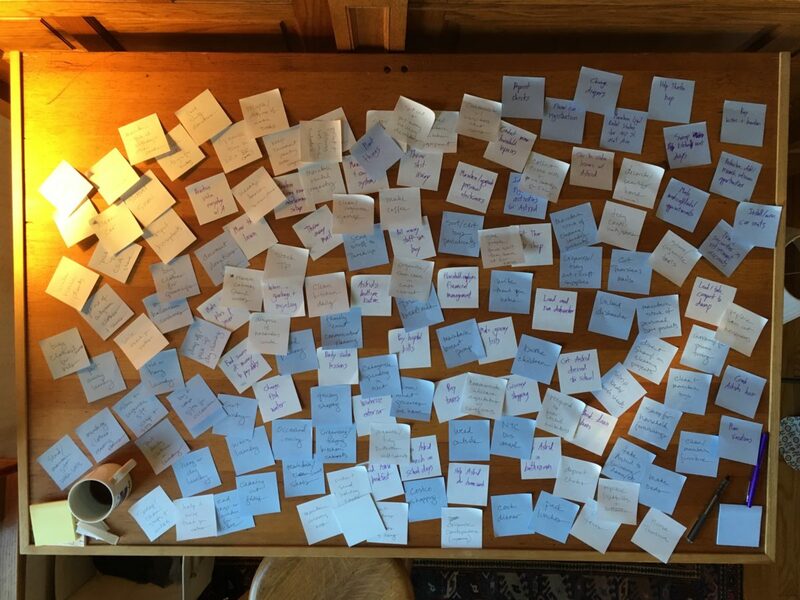 Emotional and domestic labor, often invisible, makes for lots of post-its. I know this intellectually. I have even ranted about it in secret Facebook groups now and then, talking about how many men need to step up … yet I find that many tasks that Jessica put on the drafting table are not top-of-mind for me. The itemization of this work in the form of post-its makes it visible. Buying shoes for the kids. Seasonal clothing switches. Re-stocking dish soap. Creating Evites. Responding to invitations. Planning family events. We host Thanksgiving every year, sometimes for 40 guests. I make a tasty pan of roasted root vegetables (and rake in the praise for them because I’m a man that cooks a couple tasty dishes). Jessica is the mastermind of the event, planning the details and making sure everyone is comfortable, safe, sated, has a place to sit and a place to stay. This work – being the architect of the whole event – is labor that would be scary and uncomfortable for me to take on. I struggled to break the tasks I feel largely responsible for into components. “Do the Taxes,” for instance, is a very big complicated deal at our house. It involves a household employee, rental property, two schedule Cs, and various filing deadlines and insurance requirements that occur throughout the year. It also, for me, involves a lot of anxiety. Should “Stress About the Taxes” be a separate post-it? I think doing the work to isolate these components might make me feel less stressed and more connected to Jessica. Tackling things together feels good. We have some seriously gendered patterns. We aren’t re-inventing common patterns for married cis-gender couples that I grew up around. I mow the lawn, load the dishwasher, handle finances, take out the garbage, deal with the snowplow guy, fix (or try to fix) the plumbing, and often work long hours. Jessica keeps us clothed, fed, and alive. She handles most parties and remembers to write thank you notes. She feels responsible (and takes responsibility) for the overall management of most day-to-day activities of our household. I usually drive. We have tweaked some gendered patterns. Jessica works outside our home, too – a lot. She owns a bookstore and serves on the city council. I do a wide range of household tasks related specifically to our children, and they view me as equally able to take care of them. I usually do Astrid’s bedtime and bath-time. I make sure the homework gets done. I am the main changer of diapers. I e-mail the 1st grade teacher. I take the kids to doctor’s appointments (though I don’t usually make them yet). Thanks to progressive paid leave policies at Carleton and MomsRising I spent a lot of time with both children when they were tiny. For me, making post-its was a powerful step on this journey. There are a lot of things that need to happen for our rich, full lives to go well. These things, often undiscussed, have been stuck in our respective brains and driving our behavior, but not intentionally negotiated or agreed to. Now it’s all on the table. Nate and I didn’t cohabitate until we had decided to get married — he invited me to move in with him earlier in our relationship, but at 30, with a divorce under my belt and an apartment I loved, I just didn’t want the hassle of moving unless we were committed. My mother found this hilariously quaint. 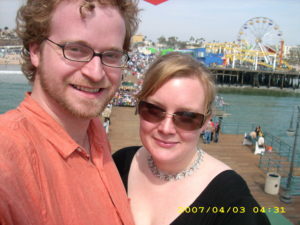 When I did eventually pack up my stuff and move it around the corner to the duplex he’d bought when we were dating, we were still in the romantic glow of being almost-married. I found it charming and delightful to pack his lunches for work (complete with cute notes!). Though I felt busy at the time, in retrospect I had all the time in the world to browse for new and delicious recipes for dinner and shop at the farmer’s market. I don’t remember when I started washing his clothes along with mine. I also don’t remember when I stopped feeling responsible for taking out the trash. Neither of us remembers negotiating anything about how we’d share the housework, because we didn’t. We talked casually sometimes about who was doing which chores. We engaged in idle intellectual banter about the reasons, too, but we didn’t sit down and agree about any formal division of labor in the beginning (and by “beginning” I mean the first 5 years of our relationship). Everyone has patterns from past relationships, and things we’ve learned consciously or unconsciously from the domestic arrangements with which we were raised. Everyone also has preferences and talents, though any woman who’s ever had a haircut can tell you that it’s very difficult, maybe impossible, to disentangle preferences from socialization. A lot of domestic patterns are connected to gender, but in the everyday ebb and flow of family life, in the organizing and prioritizing and constant renegotiating that happens in many of the marriages I’ve known, it’s a lot more complicated than old-fashioned assumptions about what people should do based on whether they’re men or women. Even for people who were raised, as I was, in steadfastly feminist households, the skills and interests we have, the ways we prioritize, and the assumptions we make about how to live together might be very different in ways that are linked to gender roles. I love to cook, Nate loves to fiddle with technology. I have confidence and expertise when it comes to laundry, and I care a lot about how it’s done. If you ask those closest to me, they may even allege that I enjoy ironing (I will deny it). Nate tends to assume that home repairs are his job, and he has always kept tabs on our finances — sometimes, I’m embarrassed to admit, without my giving it a second thought. He has always been the one to call the guy to plow our driveway when it snows. I have mostly done the cooking and the laundry, and thus I always know what’s in our closets and our fridge. There have been many times when neither of us minded anything about these arrangements. But as domestic responsibilities multiply with children, bigger jobs, and more complex lives, what was once a private, quotidian display of affection (or at least a simple, emotionless task) can easily become a dreaded chore. Responsibilities can be part of what makes life rich and satisfying, but they’re better if you’ve consciously agreed to them. So, we sat down together to document All The Things That Need To Happen For Our Rich, Full Lives to Go Well. We used a lot of post-its. Like most married couples (heck, probably most roommates), we have plenty of baggage about these things, but we worked hard to leave it aside. We wanted a survey, not a scoreboard. We didn’t argue about what’s important, or tally up who does more for whom, or air our guilty feelings about the things we think we ought to be doing, but aren’t. We just wrote it all down. This was extremely satisfying, and a lot more time-consuming than we expected. * We’ll leave the unpacking of why I had to prove my worth using every conceivable tool available to me for another day, but women who have worked in offices will not need to read that future, hypothetical blog post.